Colorado Springs, CO 11/18/14 – We have had several class wins in the Baja but the race is not something you ever really conquer. No matter how many times I race there, it never fails to drop my jaw. 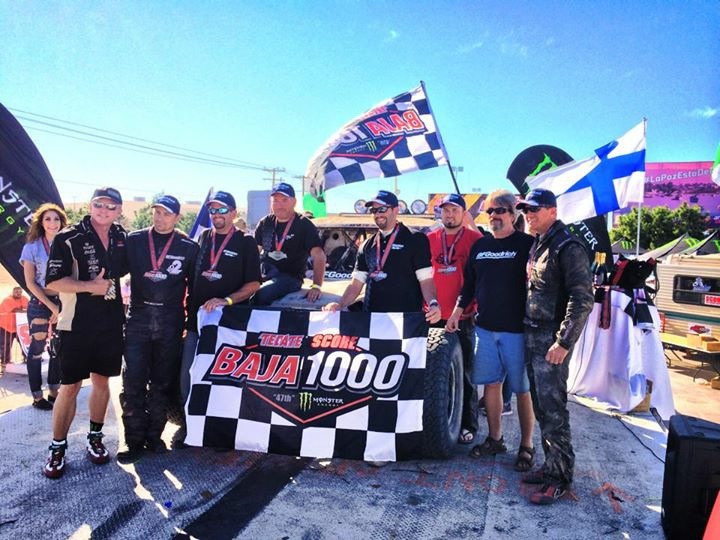 It has little to do with a typical American desert race, it is the Baja 1000. The only thing you can prepare for is for everything to go awry. At times the race is peaceful, other times intense with screaming crowds, often terrifying with unseen hazards hiding in a sinister haze. I had the privilege of driving the start of the race this year for the BFGoodrich Tires BC-1 car. The start definitely falls in the “intense” category and I loved every minute of it. The excitement and hazard of the fans lining the course has no equivalent. Fans try to touch the car as it goes by and dumbest of all – even lie in the road on the far side of jumps. While a wild ride, we made it through with nothing but positive experiences and put 35 miles on the 2nd place car in the first 308 miles. Now in the dark I navigated for my partner Brian Finch. We pounded through silt with near continuous waves pouring over the hood and blinding us. The Baja night is like no other, completely surreal and foreign. The surroundings and actions of the race can only belong in a dream. The only existence in the gloom is your small sphere of excitement. After the worst of the silt the engine lost power and we sputtered down course to a highway crossing where the Wide Open crew was waiting. I don’t know how, but we got a piece of debris in the timing belt and it skipped the timing by 3 teeth. After the agonizing wait, we chased down BC-3 to retake the lead and handed the car off to the next crew. John Williams and Roger Lovell got in at 3:25am and headed south increasing our 10 minute lead on BC-3. On one of 10,000 left hand turns they were unable to avoid a large rock that was kicked out in the road. It impacted and shattered the rear wheel. 10 miles later, a fatigued bolt broke in the front suspension. John and Roger are definitely the most resourceful guys on the team and found a way to patch it enough to reach the BFG pit. This repair took hours and to make things worse, only a handful of miles later, the transmission failed. Now in the chase truck I came in for this repair but the other chase truck with the spare transmission got lost and / or stuck for over 2 hours. Another 4 hours down, Roger and John departed in daylight. Our focus became finishing the race within the time limit. It started to get dark on the guys again after about 14 hours in the car which lead to disaster. What was apparently avoidable in daylight was now a “stuck party” for the whole race. A sprawling tidal flat that looked dry on top concealed quicksand beneath. Fooled by the dark, a dozen race cars were stuck over a couple miles and the BC-1 car was 700 yards from dry ground. Some guys radioed for help, others gave up until help got there, but our guys didn’t want to let the team down. Already exhausted, they dug and jacked the car for hours. Traction and tire performance is fun to talk about but it means a hell of a lot more to a guy in a survival situation like this and I could see it in my brother’s eyes as he told the story. Finally they broke free and passed the car off to Bud and Kyle. Bud Brutsman and Kyle Tucker were tasked with the anchor leg. We watched as they passed an access point near race mile 916. That’s about the last thing I remember before succumbing to exhaustion. Having lost my sense of time all I recall is that it was dark when I fell asleep. I heard reports that the car had been stuck for a short time in a silt bed but generally moving well. We stopped at a crowded access road and were informed that there was yet another silt bed out there that had stopped several cars for the majority of the night – great… Without radio contact with our car we tensely waited. Apparently they blasted right through because we heard after a while via satellite relay that they were down course from us. The only thing left for us to do was to head to the finish line. and with great pride we watched BC-1 take the checkered flag. 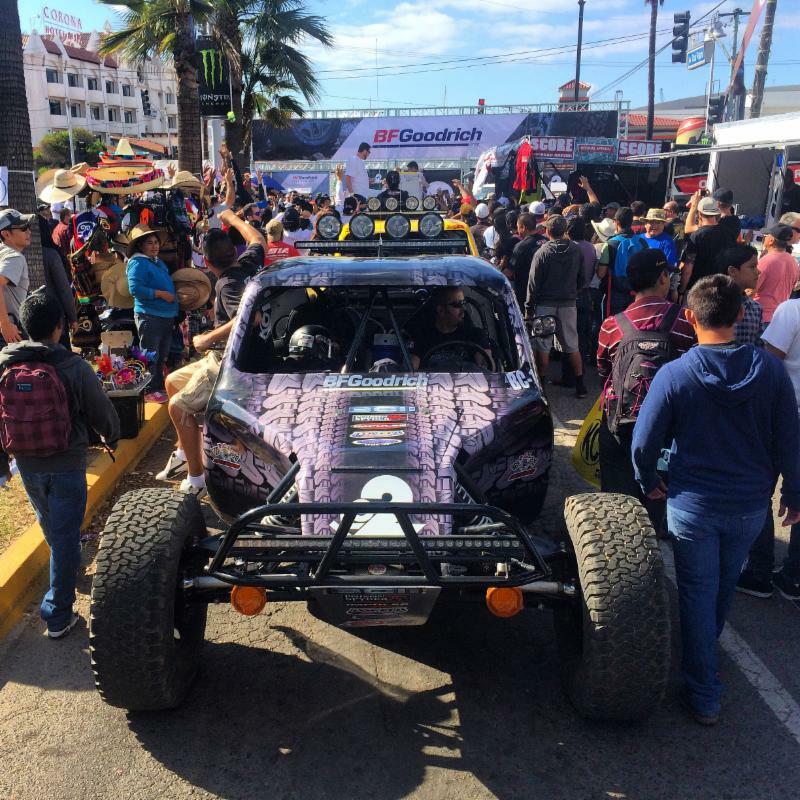 Our result of 3rd in the BC class is not what we hoped for but what is worth bragging about is finishing the Baja 1000, the second longest in history at 1275 miles. 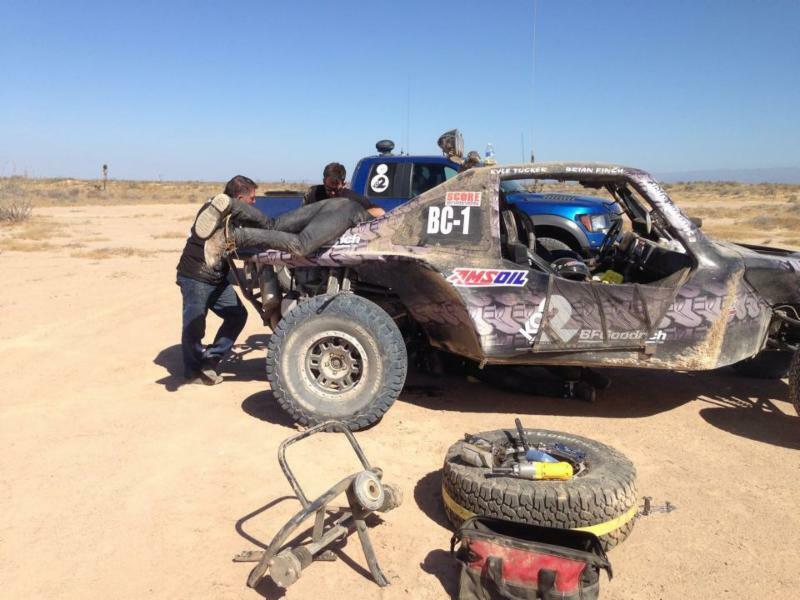 Some Baja 1000’s are tough and some are really tough. Our team had the perseverance to stick with it and win the battle to finish. It took us almost 44 hours and we spent most of fighting tooth and nail. My brother and I are proud to be part of this team and thankful to BFGoodrich Tires, BCII, and AMSOIL for giving us the opportunity to be part of such an amazing race. 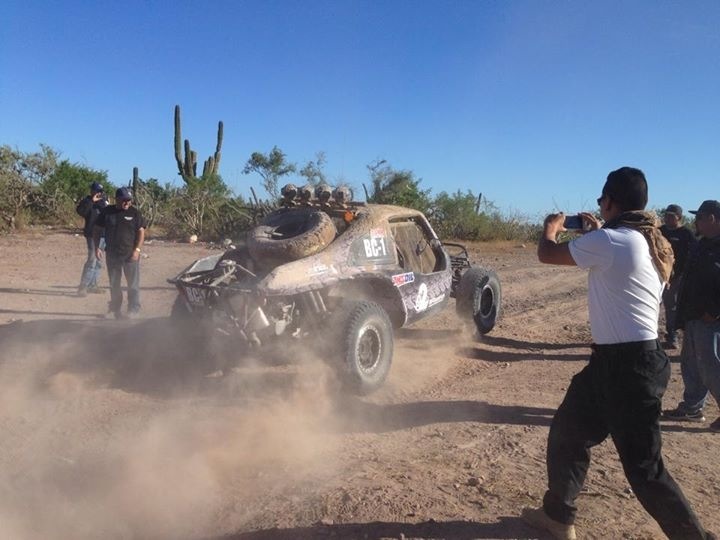 Its sounds cliche but if you want a taste of Baja racing and a truly authentic off-road adventure get a tour with Wide Open in one of these cars. You’ll never forget it.